After thirty years of gaming, I have a pretty good idea of the type of games that I enjoy. I like RPGs as long as I can get behind the story and character. I love simulations and 4X games like Crusader Kings II and Civilization. First Person Shooters are always welcome after being reared on Doom, Quake, Unreal Tournament, and it explains my two year romance with Overwatch. Competitive games infect me like Call of Duty, Dota 2, and Heroes of the Storm. Large open-world games like the Witcher 3 and Grand Theft Auto inspire me to devote countless hours to exploring all the ins and outs. Action platformers are some of the best games ever created like Super Mario 3, Ninja Gaiden, and my favorite game of 2017, Mario Odyssey. Indie games thought me that I sometimes like games in genres I never knew I liked or existed. However, games focused on the everlasting grind, punishing difficulty, and awkward controls usually turn me off. Dark Souls never spoke to me and MMORPGS burn me out. Monster Hunter World has been on my radar because of the co-op play and the series was coming to PC for the first time. I’ve always heard about the popularity of previous entries and the amount of grind and complexity in its systems. It didn’t seem like my type of game, but I was determined to give it a shot. Plus, all my friends were going to play it. When the game was finally released on Steam in August, my hype levels were off the charts. I wanted to play something unlike something I had played before. My first impressions were very so-so and borderline negative. The main story line seemed boring and the archaic online system was puzzling. Plus, the grind was off putting. After eighteen hours played, I was reaching my limit and almost quit on Monster Hunter World. But I pressed on, and 120 hours later, I am so very glad that I did. When people tell me a game “gets good after a dozen hours” or something similar, I shake my head. There are too many games to play and not enough time. My default reaction is to move on to something better and more interesting. So, allow me to be a hypocrite and tell you, dear reader, that Monster Hunter World gets so much better after 18 hours. More specifically once you “beat” the main story campaign, the game really opens up, but not in ways that are obviously apparent. There isn’t a new area or even new monsters to hunt, but the game starts to turn on the fierce but fair difficulty. 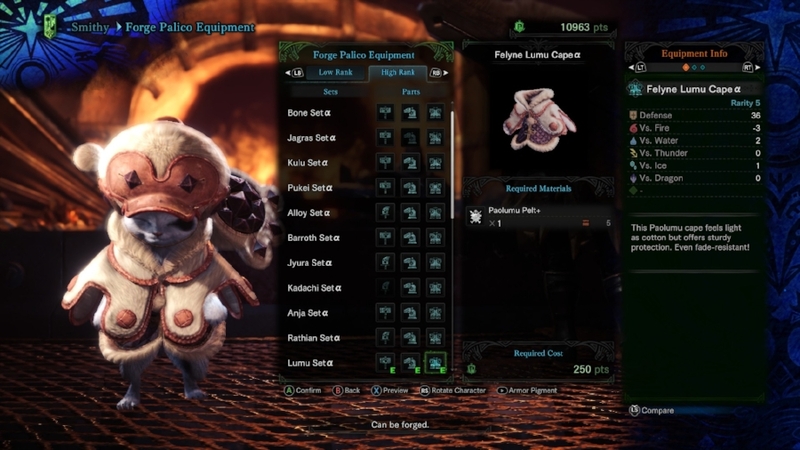 New weapon upgrades, equipment, and skills start to show up. The real game reveals itself. The grind is a satisfying one. Picture a MMO focused raid boss fights and upgrading your equipment slowly and steadily. Mix that with action gameplay on the elite level with a complex and rewarding moveset. This is Monster Hunter World in a nutshell. The earlier versions of the monsters didn’t force players to be as tactical or cautious as the harder and downright frightening battles you’ll face much later in the game. There is a skill and balance each weapon brings to the table. Each monster on the higher difficulties have quirks and aggression not present previously. Even the monsters thought of as “easy” can surprise the unprepared hunter. The monsters in MHW are glorious with personality and tactics. From the wrath of Diablos,the horror that is Vaal Hazak, the emotionless ferocity of Bazelguese, or the majestic might of Kirin, you will learn to fear and respect them, and then learn how to overcome those obstacles. I have never experienced so many critical, sweat-soaked slugfests in one game as this one. Victories can be hard-fought and truly rewarding. I am now fighting tempered monsters and I’ve had to play a bit more cautious and wait for golden opportunities to strike. One mistake can cascade into a series of errors leading to disaster. But unlike my experience with Dark Souls and Bloodborne, clutch plays really feel invigorating. I could feel when the tides would turn in a pitched battle. The difficulty can be punishing, almost unfair, but snatching a victory when all hope is lost; no game does this better than Monster Hunter World. The equipment, however, is the true star. Armor sets have different skills, and mixing and matching skills allows you to experiment and try out different combinations. Even seemingly nonsensical skills like consuming items faster are important for certain builds. Almost every skill has their place. I’d compared it to the vast skill tree of Path of Exile in which you can build your character in a myriad of ways. The fourteen weapons, though, are a revelation. Whenever I tire of one, I pick up and learn another. Each weapon changes the game you’ve been playing in not only moveset but tactically. There are a wide variety of power gauges and special moves for the individual armaments. So far, I’ve played with the sword and shield, switch axe, great sword, and gun lance. The playstyles and how I approach a battle change with the skills and weapon I have equipped. With the sword and shield, I’m constantly moving and fighting aggressively while trying to heal my teammates. The great sword is the slowest weapon in the game with massive damaging strikes, so like a baseball slugger, I’m waiting for the right time to land the big hit. I cannot remember how many times I’ve said “I love this weapon” when I’m learning a new one. Monster Hunter World is the best game I’ve played all year - and I can’t even believe I just wrote that. On paper, none of what Monster Hunter does well should appeal to me. This game has just the right amount of complexity, evolving gameplay, and difficulty to stretch my boundaries and allow me to appreciate the convoluted masterpiece it is. I love a Monster Hunter game, y'all. We live in strange times.